Pros: windows vista is great. I have never had any problems. Other Thoughts: everyone that doesn't like vista have no idea what they are talking about. Pros: Great operating system. Installed in about 15 minutes. Cons: I didn't read the title before ordering and assumed that this had SP1. It doesn't... Some programs can alter the icons in the user directory and the only way to restore them is to reinstall Vista (?). Other Thoughts: Don't believe the Vista haters. They don't know what they are talking about. Pros: If you have a machine that can run it this is a great OS. I can't complain. Pros: Better than xp and Super fast! Its pretty much perfect! Pros: Great OS. Looking forward to spending a little more time to enjoy all the new features. Other Thoughts: Using this OS for my HTPC setup. Works great so far! Cons: It cant work with or create striped or RAID drive arrays , you need home Ultimate for that so if you want to be able to run raid 0 for gaming performance be prepared to pony up the 260 bucks for Home Ultimate. This is ridiculous as i can have stripped drives on XP home which was a 99 doller OS. Other Thoughts: Microsoft should have two version just like XP, Home and Pro this myriad of variations of OS are just plain confusing an an attempt to rip off the customer for more money. So far i have yet to find ANY advantage of VISTA over XP, its certainty slower and i have a Kick bottom system! maybe Aero just lost its WOW factor on me because i ran it in Beta, but 3D task scrolling really just slows things down, pretty but not practicle! Pros: So far so good. 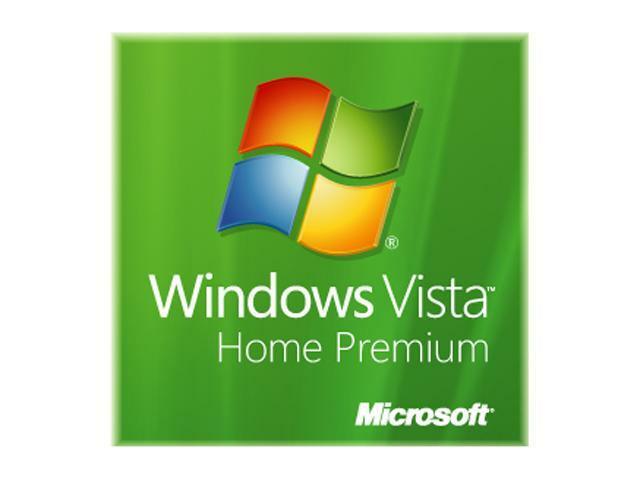 I had no problem with installing Vista Home Premium. Right now as I am typing this review I have to say that I am fairly impressed. I was very uncertain about getting Vista from many of the negative comments that I have heard. I guess it is based on lack of hardware requirements. Yes, the new lay-out will take sometime getting use to but that's really not a negative thing. There was a small hiccup if you will as I was surfing the web and in a few minutes it said what the problem was and what is a possible solution!! The hiccup was when I opend a second window in IE it flashed. It turns out that it has to do with my printer. Cons: None so far.. Will update. If there has to be a con I guess they could have made the fonts on the product key a bit larger.